Tropical plants have a special place in my heart. My gardening zone is not at all sultry, warm and humid, but it doesn’t stop me from purchasing a bougainvillea or other tropical plant for outdoor use. The plants thrive in summer but have to be moved indoors in the cooler season. Dipladenia, a favorite, is a South American native that grows in tropical forests. The plant is similar to mandevilla vine and works outside in warm zones, or indoors as an accent houseplant. 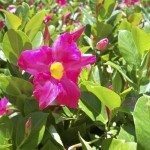 We will discuss the difference between dipladenia and mandevilla so you can decide which of these amazing flowering vines is the best option for your garden. Dipladenia is in the Mandevilla family but has a decidedly different growth pattern. Mandevilla vines climb up vertical structures to seek the canopy light. Dipladenia is a bushier plant whose stems grow down and hang. The two plants have similar brightly colored flowers, but mandevilla has a larger flower typically in red. Both plants need the same bright light and dipladenia care is the same as that for the mandevilla vine. When deciding between a mandevilla or dipladenia, the finer leaves and smaller flowers in a wide range of colors may win the day for the dipladenia. Dipladenia has a fuller shape than the mandevilla. A major difference between dipladenia and mandevilla is the foliage. Dipladenia leaves are fine and pointed, deeply green and slightly glossy. Mandevilla vine has larger leaves with a broader shape. The flowers are trumpet shaped and full in hues of pink, white, yellow and red. The plants respond well to pinching as they grow, which forces out new bushier growth. Unlike the mandevilla, dipladenia doesn’t send out as much upward growth and doesn’t need staking. One of the better dipladenia facts is its ability to attract hummingbirds and bees. The tubular flowers are a vibrant signal to pollinators as ample suppliers of nectar. This plant requires warm temperatures for best performance. Nighttime temperatures should remain around 65 to 70 F. (18-21 C.). Water the plant frequently in the summer but let the top few inches of the soil dry out before watering anew. The plant can go in the ground in warmer areas or stay in a pot. Bright but indirect sun is a requirement for growing a dipladenia plant. The best flowers are formed in a well lit area. Pinch of gangly growth when the plant is young to force thicker stronger branches. The only difference between mandevilla and dipladenia care is that mandevillas require a trellis or staking. Dipladenia only needs a stake to keep the little plant straight as it matures. Fertilize every three to four weeks during the growing season with a liquid plant food as part of good dipladenia care. Overwinter indoors or in a greenhouse and suspend fertilizing in winter. With a little luck, even northern gardeners can keep the plant growing indoors until the heat of summer arrives. Read more articles about Mandevilla.